Here’s a Storify of the lovely Digibury event at the Gulbenkian in Canterbury! Set your main e-mail client (in my case on a Mac PowerBook gathering 11 mailboxes worth) to only collect e-mail once per hour – each hour use GTD techniques to respond to e-mail – if you can do it in less than 2 minutes then deal with it, if not schedule a time to deal with it. Get back to writing as soon as you can. Always have your phone on silent – when a call comes in – have a quick look – be ruthless and push it to voicemail. If it’s a client, friend or otherwise important – take the call; deal with it quickly. You will return to writing with more energy. Distinguish between the important and the urgent. Go on long train journeys – buy cheap first class tickets in a quiet coach (often cheaper than standard if bought in advance) and write, write, write. They will bring you tea etc. This is good. 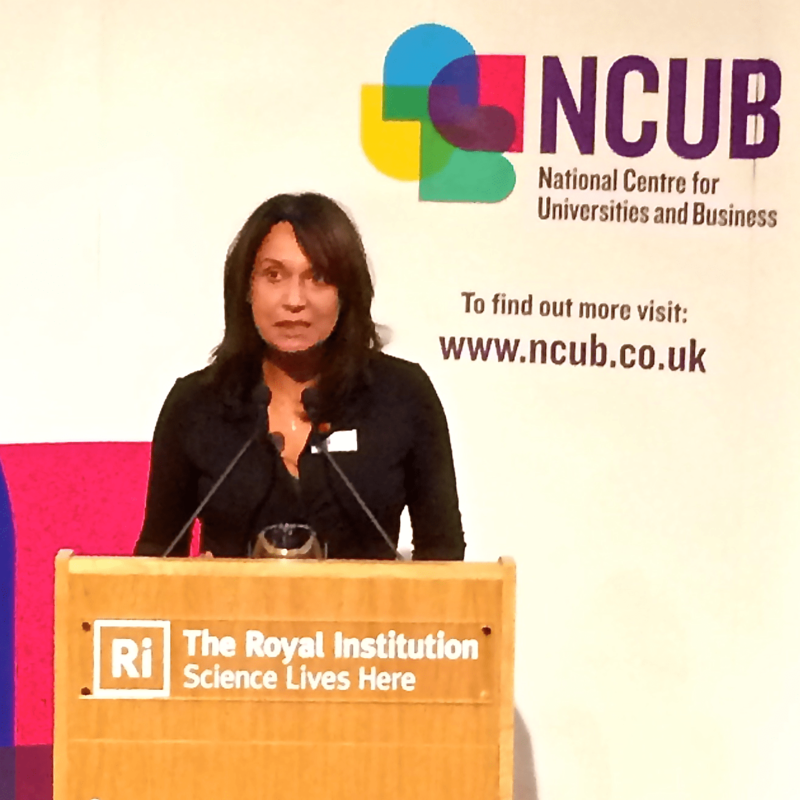 Ruby McGregor-Smith, CEO of Mitie, speaking on Women in Leadership: Breaking Down Barriers. David Docherty says Ruby is one of the few women running a FTSE 250 company. Women have a massive role to play. 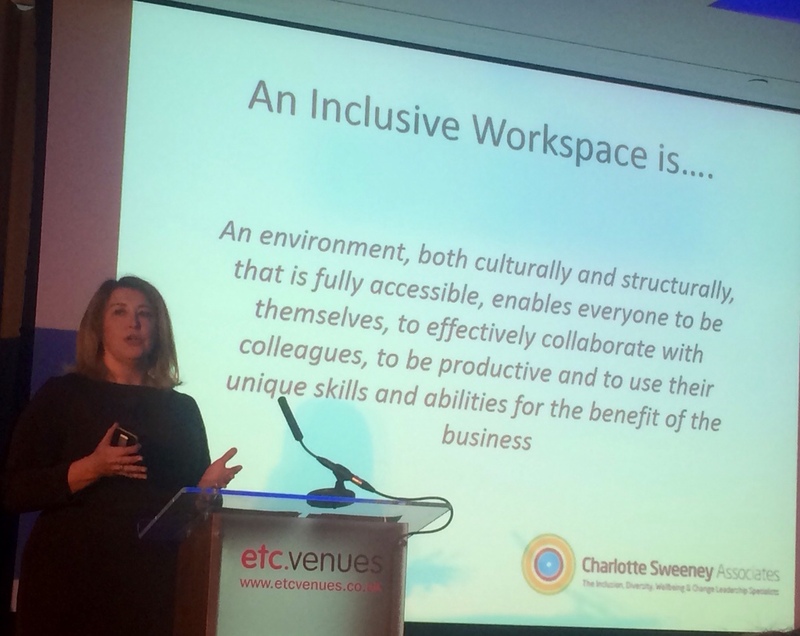 We need gender equality at the top of businesses and we need to celebrate diversity. I was successful because I joined a very young organisation in a very young industry. We had fewer hierarchies and could think about talent differently. The Chair and CEO said ‘we’ll teach you’ as they knew I hadn’t done it before. It needs mentoring and support at different levels in women’s careers. When I became a mother – it was almost impossible to juggle everything. I took 2 years out. The non-execs of MITIE didn’t really understand that, but it worked. She also chairs the Women’s Business Council – and that’s about understanding the barriers at each stage of a career. It starts early in schools and colleges and Universities – and it’s about setting aspirations. Needs more collaboration on careers – and this is pretty weak still. We’re still grappling with understanding how and where to recruit the right graduates for example. Loads of barriers – how do we start a business – where do we get the mentoring and support we need. While things have changed over the past 25 years – there is still much to do on diversity – beyond gender. Need to make sure young people demand and expect equality in the workplace. More work to do. We shouldn’t underestimate how far we’ve come – and culture is slow and difficult to change. We do need to support people to rise through the ranks. 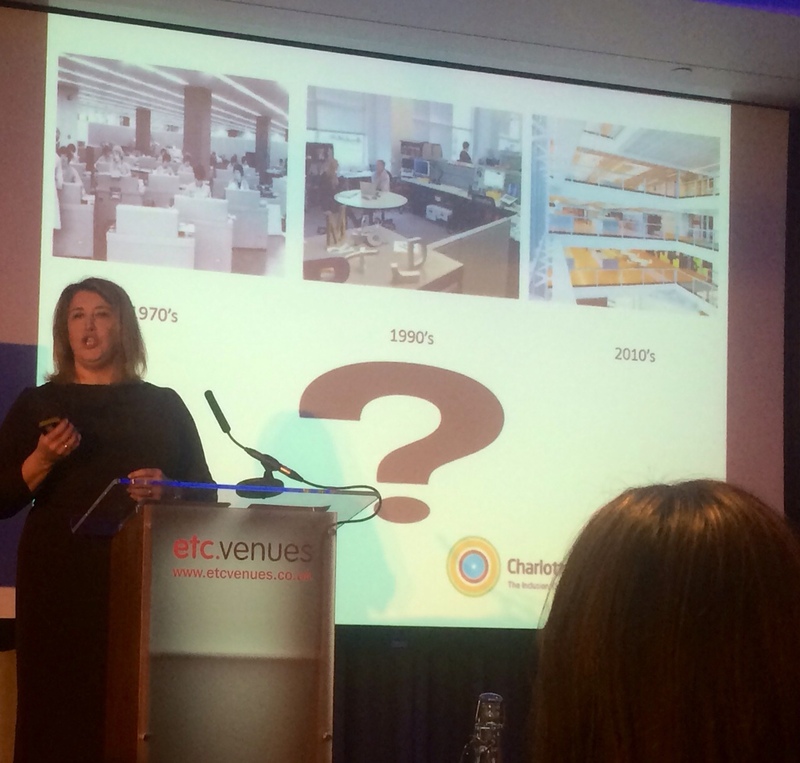 In the world of facilities management – it’s very male dominated. Don’t focus on your differences – focus on your talent. Difficult to achieve but we can make progress on this – at every single level. Young people need the biggest possible aspirations – and it’s time to make sure this happens and that people see the opportunities and are able to grasp them. Q- what role doe employees have to play in helping with career guidance? Ruby says that school is very different from the workplace – we need to help young people to understand what work is like – and there’s a role for existing employees to help with this. It’s very important that graduates and others are supported in the early stages of their careers. Q – what is in the gift of the government? Flexible working is very important – and affordable childcare for families (not just for women). There are specific things government can do. They’ll say there’s no money – but they have to spend money on something. Better workplacements, a better understanding of the role of outsourcing – not always the most popular of industries. Q – which countries have better working practices than the UK? Ruby says the US is better in certain areas – but she doesn’t like quotas. We have a multi-level problem. We seem to have issues at each level in our organisations. Q – how about the difference between the best person vs the best team issue? She says if you pick the best person they should find the best team [errrm]. Ruby says they are as important as graduates and often better. We have about 500 apprentices and this is more than the number of graduates we recruit. They are very important to us. Q – re aspirations and people recruiting “people like us”. How can we change this? Select talented people and give them responsibility early – be less hierarchical – fast track people to big roles early. Q – re lifelong learning – how to implement in business? Ruby responds that we need to make developing people integral to the role of the business – send them to a business school – make sure you keep them up to date – very important. Q – who helped you develop and who mentored you? A – Not about age – it’s about ability to deal with change and deal with rapidly moving markets. We need to help women get back into work – it’s a big untapped market and they need to be brought back into the workplace. Q – How do we deal with demands on women to be the main Carer especially as parents get older. How do we change that? No easy answer. It’ll take a long time – but increased flexibility in working will help – fitting more things around work. Changing society is a tough call. A – Boards need to be family friendly – once that happens things will improve. A Once you’re out of the workplace – the phone stops ringing and no one is interested. This is very difficult. It is very hard coming back in – and you just have to make it work. Q- do you need to behave like a man to make it in business? A – It’s a shame if women feel like that – it’s important that people are prepared to be themselves. I always tried hard to be me and I think that’s the way we can make progress. John is an early pioneer in social investment – and while there has been loads of growth and noise – we need to remember that it has to be about ‘a locality’. Social investment is a tool in the toolbox – not a panacea. It is a useful tool. We started by trying to work out what the demand in local communities might be. What are the needs – particularly for finance – from local social enterprises and organisations with social objectives. Social investment needs to be a mechanism that meets local needs and supports the mission. It’s about access to capital for charities and others – and while there’s large scale lending now – more difficult for local organisations to access smaller, simpler forms of social investment. Social investment can help to tackle social problems – cites example of the first Social Impact Bond – helping to prevent re-offending by young people in Peterborough. 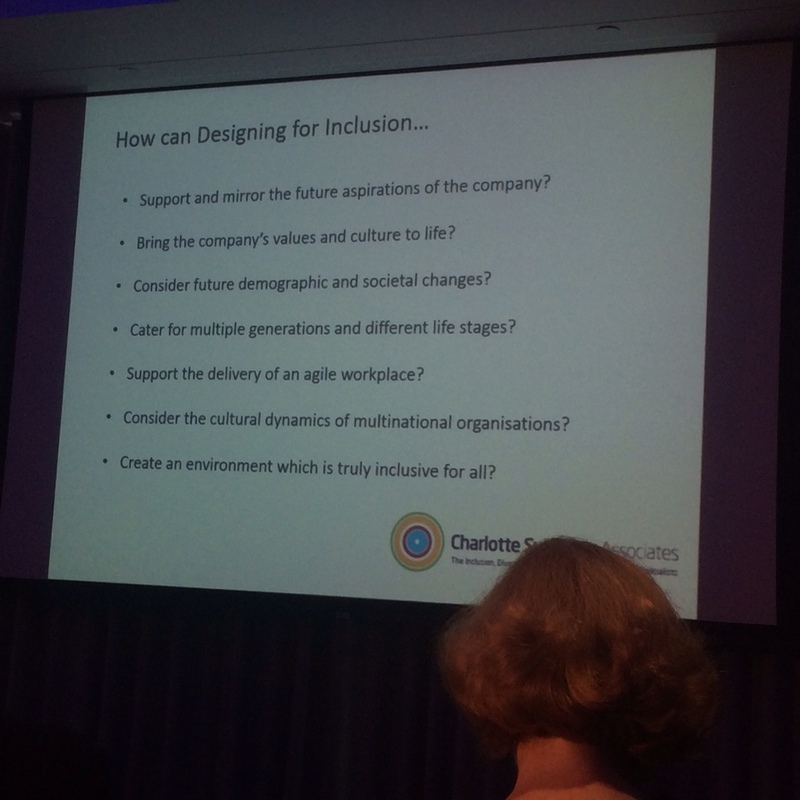 These mechanisms enable organisations to work together with flexibility – draws analogy between dinghy sailing and a rail journey. Dinghy needs constant adjustment – trainjust goes. SIBs are an example of a locality coming together to tackle problems on an integrated basis. The fundamental difference between a social investor and a grant-maker is that the former looks to build capacity in the organisation; the latter buys a solution. merit in people coming together in a ‘safe place’. Politicans want answers by Wednesday week – the problems tackled by social investment are often complex and the timescales can be 7-10-20 years. It’s an investment philosophy and it needs to be long term. How do we avoid the report ‘staying on the shelf’? This is very important to us – we want to see action – and suggest 3 practical ways of using the new tools. We look forward to debate and pushback! He heads up social investment at the Cabinet Office and was part of the conversations behind the report. Social investment is about helping social ventures achieve more impact. It is about in impact philosophy. Pioneers often philanthropists. There is though from a national perspective ‘a mountain to climb’. Social ventures a innovative (more than commercial ventures he says). But there are challenges in coming up with robust answers to spending challenges at the local level. We need a national/local debate. How do we see common principles? We need leadership – to take the principles and make them into reality. One Westminster CEO – we are a lot of grassroots organisations and we feel that sometimes these reports come from another world – how can we connect? John – needs access to very simple social investment products. The Social Impact Bond is at the complex end of the problem. But we do have some examples of local charities providing services as part of a SIB. It has to be about accessing capital. We need to be able to pay for assets over extended periods – and we also need to open up access to income. Q – Larger organisations often feel they can be responsible for and help smaller groups – but it’s difficult given the funding picture and also the lack of robust systems in smaller organisations – even managing a £4,000 needs systems. Point from CEO of a local development trust. We need to recognise that often small organisations may be able to make big impact – but they don’t have scale and the system of ‘big is better’ commissioning acts against supporting local organisations. You’re preaching to the converted. The challenge needs to be to the people who have the money – and power to commission. They need to invest in social capital. We need to engender the debate – commissioning may not lead to the best outcomes. Point from a SBus person – The uncomfortable thing about the report is paying back £18k when you’ve borrowed £10k and you’re funding revenue activity. Too risky. John intervenes and agrees that – it might be ok for capital – but it’s risky for revenue. We mustn’t encourage people to take unnecessary risk – needs to be appropriate risk. A matter of judgement. Sometimes we need facilities available as a ‘safety net’. Social investment can provide such a safety net. In the case of the SIB – we can see that working over 3-5 years based on a consortium approach, especially for smaller local charities. Need to be part of a combined integrated service. I agree with you and I am jumpy – which is why I’ve taken time to answer this question. Q – do all the charities invested in have to be incorporated? This has been an issue. John says most organisations and social investors will invest in a ‘purpose’ rather than a corporate form. It’s about the social purpose. Paul Doe – CEO of a Housing Group and St Mungos Broadway (which has a social impact bond). Do something you know really well. We take the risk though – the investors will not take any risk. You have to be very careful about what you get into. The legals etc took £50k. Positive – what about crowdfunding – this has not been mentioned and returns an be good. We need to invest where we live. Kieron Boyle – need to be clear about who is helping social ventures get ‘investment ready’. From government’s perspective it’s often a challenge to move money towards preventive services. Also it’s a challenge to buy from small organisations. Cites the social value act as part of the process. Needs to be joining up of the national and local. Can we align local money with national commissioning to make it work. Agrees that crowd funding can work- but it seems to be skewed towards equity investment – this can be a challenge for some organisational forms. John – needs a way of attracting local people to own and be part of the solution – and it may not be pure investment. CEO – Westway Trust. The market has been developing – cites Good Deals Conference. But does the intermediate layer take out value rather than add it? There are some mid-sized organisations that need support and don’t really see it working well. be in a dialogue with organisations – especially mid-sized ones. Kieron says that there are some intermediaries that are very good. David Warner London Funders – an apposite time for this report. Funders and investors see the need for a range of products including grants at the local level. Need to invest to tackle problems over a longer term. Needs to be new ways of unlocking local giving and therefore local capital and social investment. David – need to combine the Triborough approach more broadly with regional reality. Need something to glue the top-middle-bottom to make systems work. There are issues over capacity for CVS organisations – they’ve taken a battering. Agree that crowd funding is a really interesting opportunity – there are people with disposable wealth – and we need to engage them in local investment. There is a piece here about private investment from local businesses – can we get social investment from them? There’s lots to do – need to be realistic about the scale of the task. Needs to be a local and a regional task – need to make sure we spread further than London possibly. “I’ll be e-mailing – need to form a task force”. In 5 years time 36% of the working population will be over 50, we'll have 5 generations in the workplace. Can you make the workplace feel like a village or a street? can 'life seep into work'? Who and how are we designing for? Maybe we should be designing 'around a needs envelope' – comparison with the design of aircraft. Moving into a discussion session where so look at potential next steps or areas for further work. Tom asks for a non-moaning positive discussion about positive actions that can come out of the thinking so far. Janis says she represents ‘the happening and the social’ – interesting to get into the socio/political aspects – and the aspects of ‘cloaking’ to enable action in difficult situations. 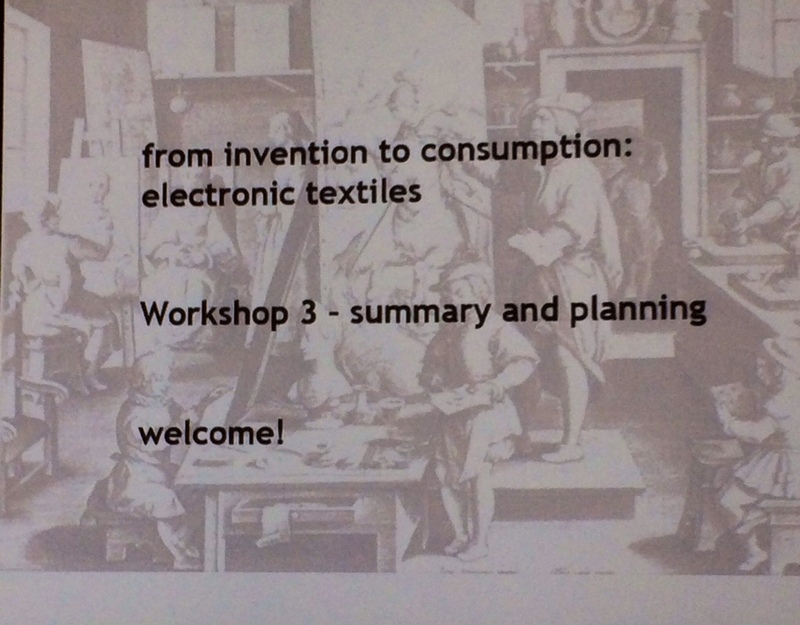 But what do electronic textiles actually mean? Danger of ‘meaning loss’. How do we define them and what does it mean? How do these things fit together – as objects and as expressions of materiality. In a world that moves away from ‘things’ as objects. And can we differentiate between electronic textiles and smart textiles? The difference between the here and now and the ‘in and out’ (whether the device is embedded inside the body or just outside it) and it can be on completely different scales. Possibly even embedded in people. The need to think about technology in a different way especially as it becomes more ‘intimate’ and closer to the body. It’s all about the technology – and people seem resistant to take up electronic textiles – as too intrusive. Yet they use mobile phones always and feel they are being controlled by their phones to a certain extent. Radical innovation driven by design-led activity (rather than market-based product development). Examples of pressure-sensing bandages, examples of military applications to clothing and vehicle monitoring systems. The speakers in this opening session are: Tom Fisher, Adam Drazin, and Janis Jefferies. Tom – While there’s a lot of work going on in various laboratories, the seems to be a lack of relationship between the ‘heat and light’ in fashion, performance and art – this doesn’t seem to me to be feeding through into actual innovation in practical applications. 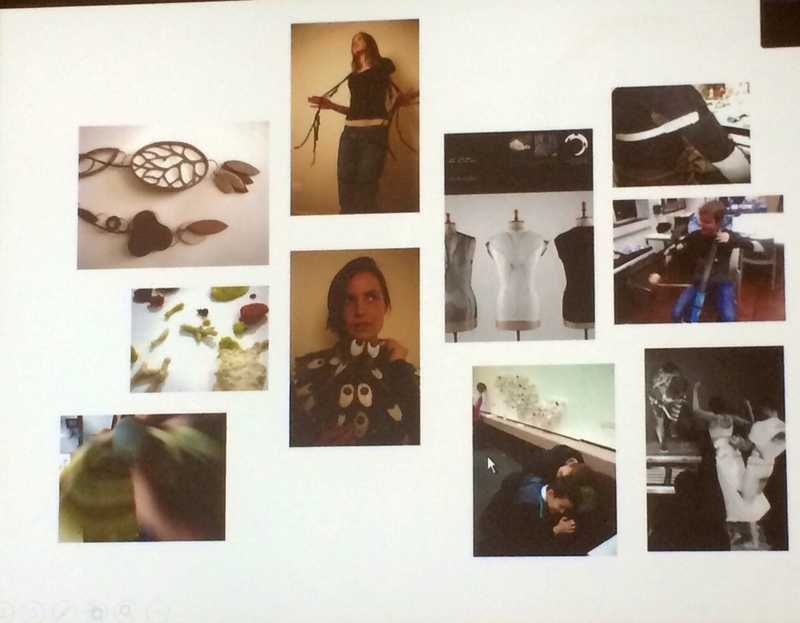 Adam – issue he’s seeing is to do with ‘ecosystem’ approach and how it doesn’t link to textiles. Not sufficient to focus down on specific uses – textiles are almost too ubiquitous. Whereas a broad brush approach is not sufficient and too general to provide insight. The concept of Utopianism and people’s aspirations not being met. Borders between professional world and everyday world very blurred. Cites worries and dis-illusion in the material world. How we engage with work clothes in a hospital say, and in fashion are very different. Utopianism and the future of the body. Not about temporal models placing the body on a pedestal. Janis – involved in weave – it’s about ‘electronic communications in cloth’ for her; and look at the links to privacy and surveillance. new ways of knowing and composing relationships and what does that mean in terms of ethics, care and new ways of living? Need also to look at different publics and representations – and who controls that data. Weaving and textiles analogy is very strong – commenter says she follows what Janis says and feels that it’s important. “Knots and nodes” says Janis. Needs not to be a one-way relationships – must be back and forwards “A shuttle!” Says Janis. How do we make things skin-like rather than silicon-like? Why are textiles so slow to get “smarter”? 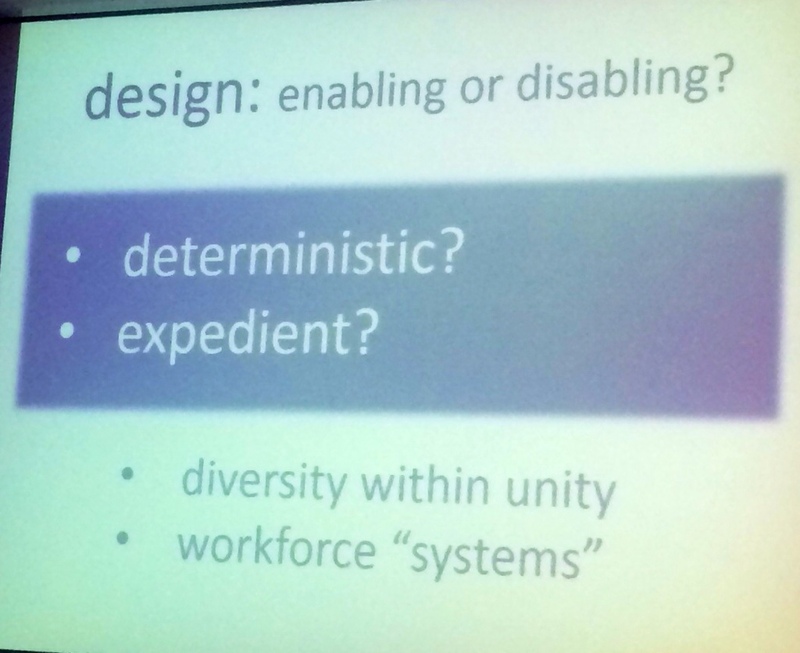 Seems to be a big issue over the need for integration across many disciplines. Digital – physical – sensory fusion will take the next 5-10 years. Lots ‘bridging’ between science/tech and design. Argument – from audience – say little demand for body-monitoring – no one wants to be told what they already know by a technology that tracks heart rate – we know we should loose weight, be healthier – and what would I do with the heart rate data anyway? 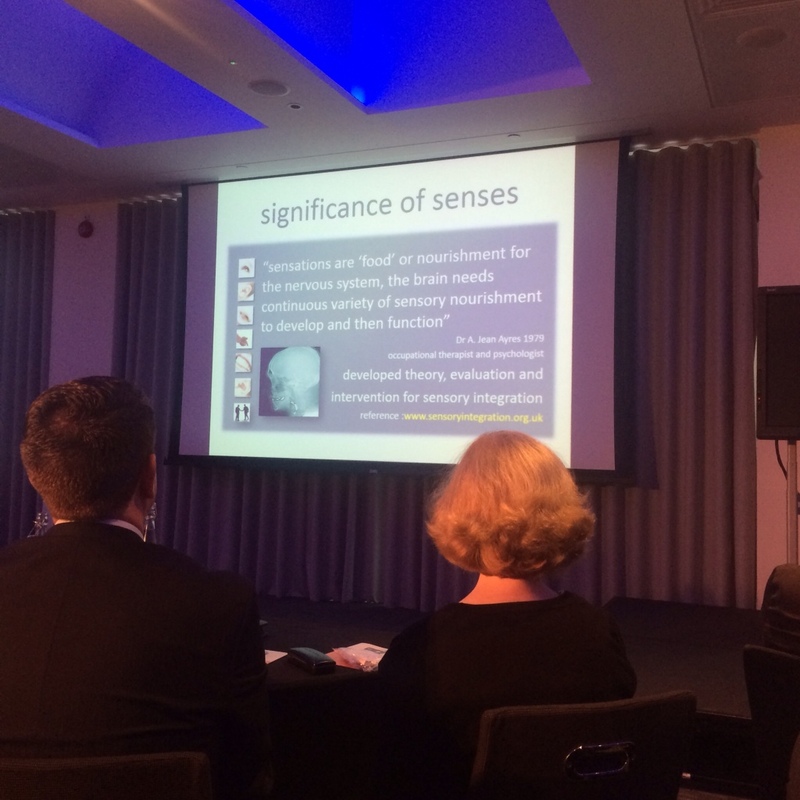 Raymond says that how we look at ‘soft responsive’ technologies for rehabilitation – part of health and wellness. Q re visual anthropologist – looking at how you do things. Yes – they are studying how we are operating and what we are doing. 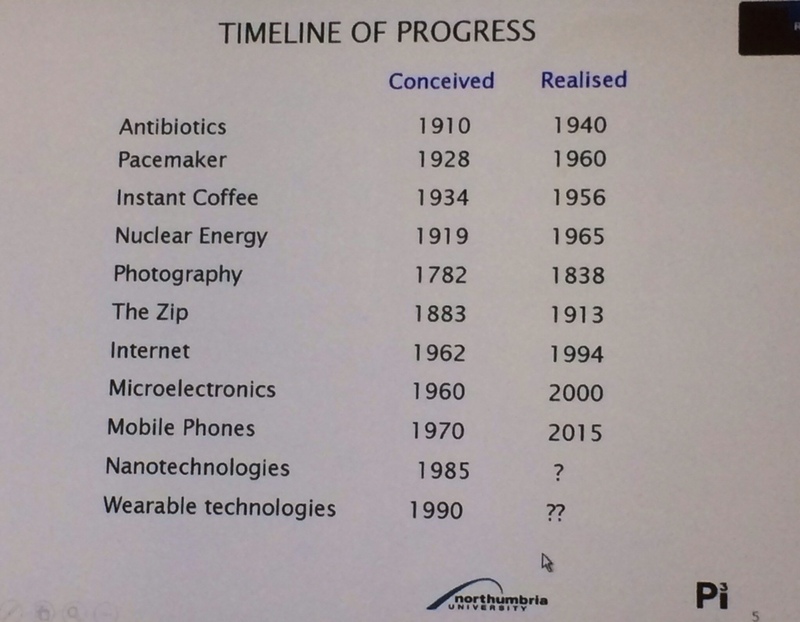 Janis – soft logic of emerging trends especially in health monitoring. Raymond is taking a very technologically driven approach – look at the charts – and now talking about hydro gels with embedded pharma and what’s called 4D printing. Work embedding wireless technology in jewellery – and ‘working from the body’ up with dancers and performers using technology. 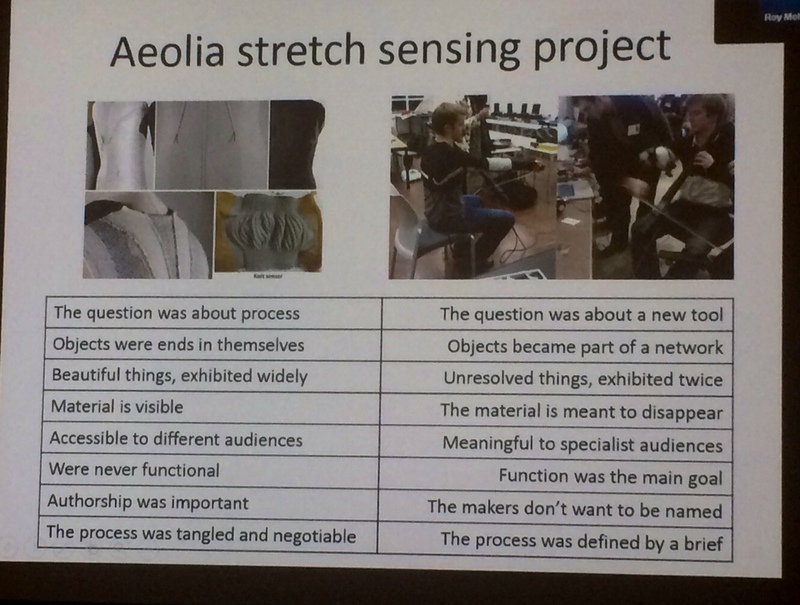 Using the Aeolia stretch sensing project as an example – and look at the ‘dilemmas’ table – interesting! Why do things have too be unobtrusive? We might want to make the technology visible in public. 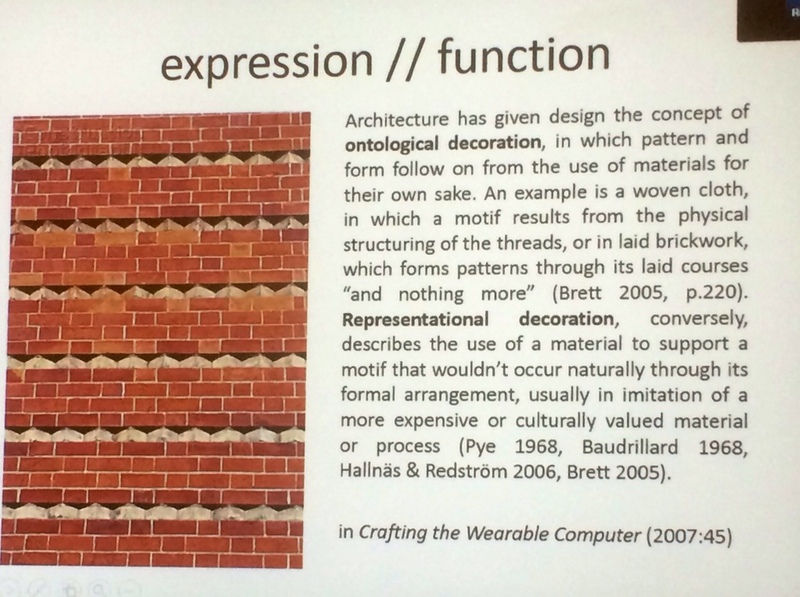 “Critical design is part of the lingo in design – doesn’t seem to happen as much in textile education”. Not everyone agrees with this statement. The difference between expression and function – different levels of scale and construction. 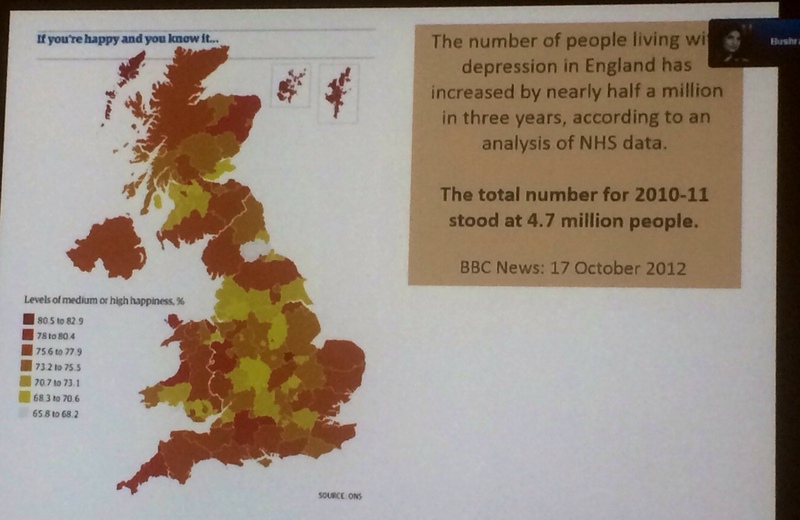 Using the statistics around depression – and Sarah is working with the mental health charity Mind. Lots of people showing up at Mind services without a clinical diagnosis. Complex network of issues. 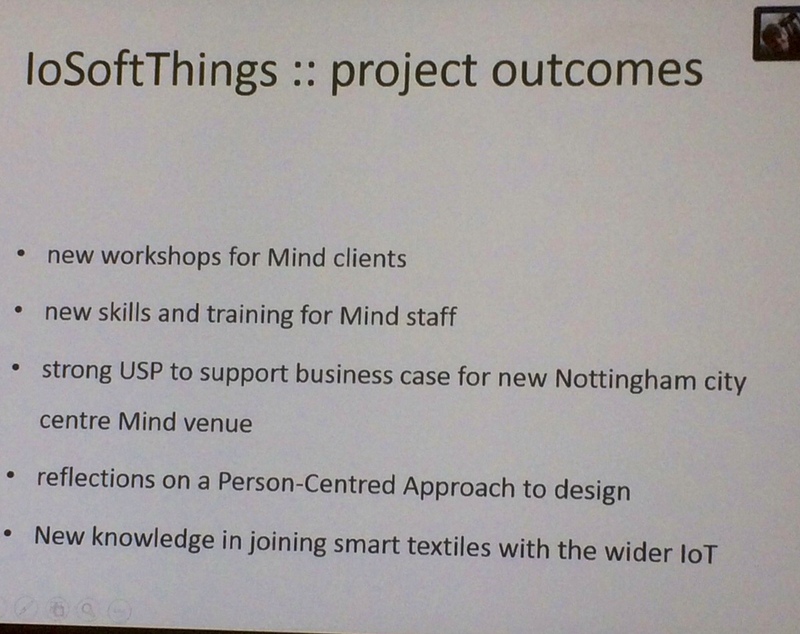 Now talking about the difference between ‘technical’ and ‘smart’ textiles. And also the example of “person-centred design” vs “user-centred design”. 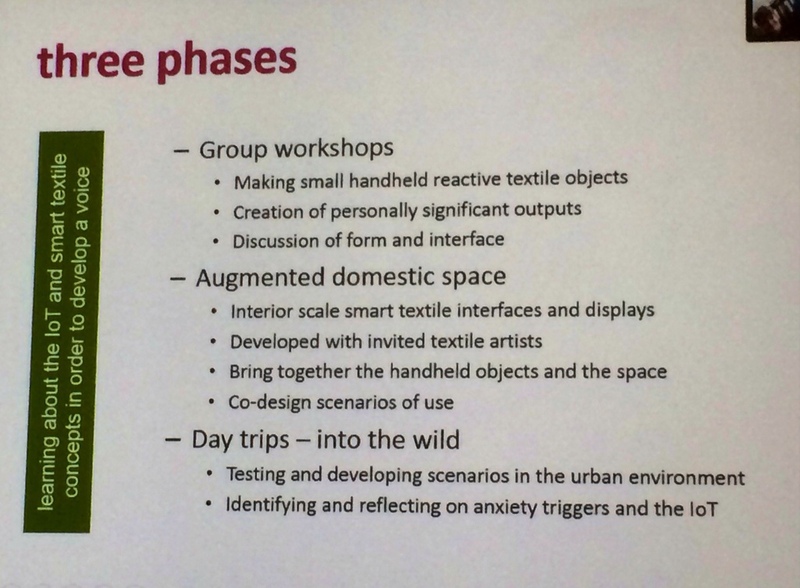 Three phase of proposed research. Janis – q of gender and demographics – and high suicide rates among 18-24 year old men in Ireland (a project Janis has been involved with). Sometimes organisations like Mind are ‘already too official’. He made you sound like a suburb of Palo Alto! Interesting approach by Rohit – and a suggestion that we take a bit of a step back and take time to reflect on what this all means; what the implications for Bradford are. He was insightful on Brian Cantor’s remarks – which were delivered at high intensity and high speed – a blizzard of bullet pointed facts!